Until now, we haven't had the pleasure of playing with a midrange part based on current generation technology. At present, those who have wanted good performance at lower prices have gone with older cards that have fallen in price. This is all well and good, but consumers lose out on all the new and improved features of the latest architectures when buying high end cards of a previous generation over the midrange cards built with current technology. This is especially pertinent in light of NVIDIA's Shader Model 3.0 support. Generally, anything that can be done in SM3.0 can be done in SM2.0, but the advantage is code complexity and (sometimes) performance improvements. We've already seen examples of this in our SM3.0 analysis under FarCry. 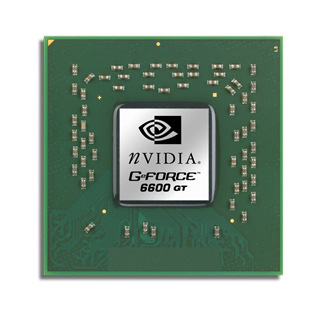 Also with the new 6600 line of cards, NVIDIA is bringing out their first native PCIe line of GPUs. These should quickly be bridged back to AGP (we are told), and the sooner we see the AGP version the better. Even if PCI Express platform market share were better right now, the niche the 6600 series of cards proposes to fill is one that could appeal to everyone who uses a computer. The keys behind the 6600 series (aside from feature set) are performance and price point. All of the aspects of the 6600 series fall in line to offer a card that promises amazing value. But we don't care about promises here. We will take a handful of the latest and greatest games across the spectrum (with a heavy focus on PS2.0), and we'll see how well the newest member of the NVIDIA family performs. As far as competition goes, we'll stack it up against current and previous generation ATI and NVIDIA cards and we'll include ATI's current midrange PCIe card, the X600XT. This isn't supposed to be a direct comparison, as the X600 is still based on previous generations ATI technology. We will make a bigger deal of the ATI/NVIDIA comparison when we have a midrange R4xx desktop part in our hands. Anyone got any info on release date?Only thing I have seen is "sometime in Sep" but I don't see any place to preorder or any manufactuers advertising it. I don't have any insider information, and I haven't signed any NDA's, so I can say that NF4 is probably due out within the next few months. That could be wrong, of course. There will be a 6600 vanilla part, Visual, but due to the use of different RAM and other factors, we do not have benches for that yet. It was mentioned on the second page, forth paragraph. I'm sure they're coming soon. Finally, regarding the 6800 vanilla vs. 6600GT, there are two things to consider. First, how much faster is the 6800 when running on the same system? Generally, it is slightly faster and up to 20% faster when the system is essentially the same, so 50% more for up to 20% performance probably isn't worth it to most people. The bigger problem, however, is that the 6600GT is a PCIe part. There should be AGP bridged versions in the future, but how far off are they? After the "paper launch" of the X800 and 6800 cards, I wouldn't expect an AGP 6600GT for another six weeks at best. The 3d performance would be perfect for today, and you'd have 4 monitors (or 2 monitors/2tvs) max.. if it could work without disabling NF4's IGP, 5/6 monitors, just trashing ATI's hyrdaview! Seeing this card named "GT" I wonder if there will be cheaper versions of it... any info on that from nVidia? First, perhaps the disclaimer wasn't big enough, but running the tests on different platforms is never an optimal solution. This can and will affect the results in various instances. A 3400+ is a very fast chip, but the 3.4 GHz P4EE is still going to beat it in many situations. However, going back and running hundreds of benchmarks on different platforms really isn't an option. At some point in the future, I'm sure there will be a more equal roundup of the cards, but it's just an approximate measurement of performance anyway. If you look at the "performance estimates" in the GPU Cheatsheet article we recently published, you can see some additional support for why the 6600 GT would sometimes beat the 6800 vanilla. In pixel performance, the raw clockspeed of the 6600GT puts it just a fraction faster than the 6800, while it's slower in bandwidth by a relatively large amount. They're also pretty close in vertex processing power. Change the CPU from a 2.2 GHz 1MB L2 A64 to a 3.4 GHz 2 MB L2 P4EE and the closeness of the cards can end up pushing the GT ahead in cases where the P4EE is faster. Without knowing the internal structure of the chips and cards, we can't say for sure, but there could be occasions where an 8x1 chip makes more efficient use of its resources than a 12x1 chip. Perhaps certain latencies are higher on the NV40 than on the NV43, or maybe a 12x1 pipeline setup just taxes the memory in a different fashion.